As school counselors, we are constantly assessing the needs of our students, parents, staff, and community. When needs present themselves, it can seem challenging to figure out how to best serve our students, but that is where creativity and innovation come into play because as school counselors, we know we have to get creative! Julie King (@counselorinthemiddle), a Professional School Counselor at Belle Fourche Middle School, used creativity and innovation to create and implement a program addressing a need that she saw at her school---educating parents about online safety for their children. 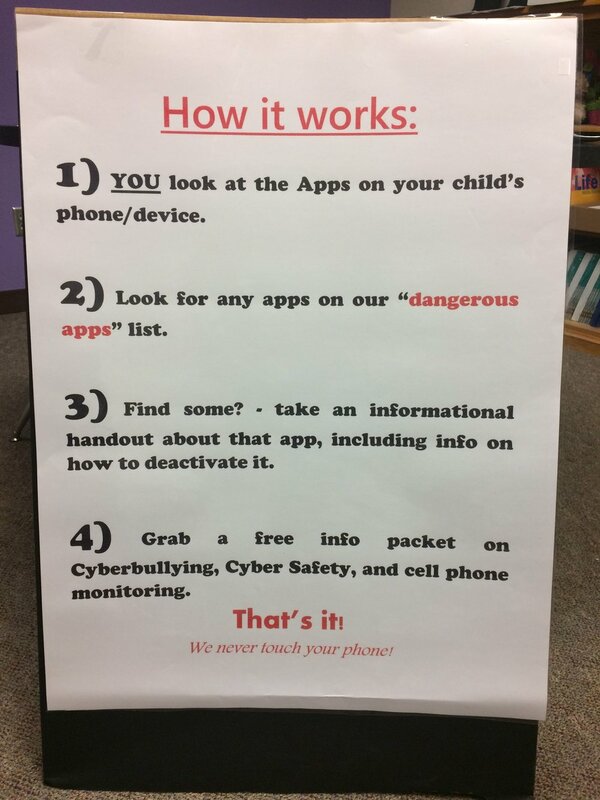 Ms. King created an App Check program where parents were educated about dangerous apps their children may be using, social media safety, and more. Ms. King shares how her idea for App Check came about, the process of conducting the App Check, its success, and more! How did your idea for the App Check come about? As a middle school counselor, I spend a great deal of time sorting out issues that students have created online. Students get into a bad situation by misusing technology outside of school, and we start to see it effect the school day. Truancy is a common indicator. And often disagreements or harassment started online is continued in person. When we contact parents about what is going on, they are often completely clueless about the apps being used to perpetuate these situations. Their student has intentionally been secretive about their communications. And, not wanting to lose their phone or tablet, they will often not tell their parents when something has gotten out of hand online. Can you describe the App Check? It became apparent to me that educating parents was a vital and missing part of keeping kids safe online. Educating parents was imperative for preventing the types of issues that were surfacing at school because of students online habits outside of school. So I began to research the topic of dangerous apps for students. At first, I thought I might do a newsletter for parents. But the more I read, the more I realized I needed a more-impactful opportunity to share this information with parents. It needed to be in-person, and our fall open house was the perfect venue. And in that moment, the “App Check” was born! What is the process of the App Check? Parents take their student's phone/device in hand. Parents visually scan the homescreen for the icons of apps on our Dangerous Apps List (displayed in large format on the wall behind me, and in a handout). If they find some dangerous apps, we hand them an informational packet about that app, including how to deactivate it, should they choose to. Everyone gets a free packet of information on cyberbullying, cyber safety, easy-to-use cellphone safety contracts, and information on cell phone monitoring services. That’s it! We never touch their phones! How did you achieve parent, teacher, and administrator buy in and support for the App Check? I verbally told my principal about my App Check ahead of time and reassured him we would never touch their phones, which was his biggest concern. I did have to inform our schools’ IT department about what I was up to because the research required that I be on some not-so-appropriate sites, and printing from them. Anyone looking at my browsing history would probably wonder what I was up to! App Check received overwhelmingly positive feedback! I heard time and time again how happy parents were to have this information, and what a great service this was. Many parents took handouts for others, and one family even called their high school son to meet them at the middle school, and surprised him with an App Check too! Is this something you would do again? App Check will now take place once in the fall and once in the spring each school year. What would you change or add, if anything, to the App Check? I will need to continuously update the Dangerous Apps List, as the technology changes at lightning speed. Once an app gets a reputation for being dangerous, it has a tendency to disappear, only to pop-up with another name later. So I have my work cut out for me! But educating our parents on dangerous technology is integral to keeping our students safe online. Through her innovation and creativity, Julie King implemented the App Check to support both parents and students in our tech-driven world. Ms. King’s dedication to keeping her students safe online will undoubtedly have an impact on her school community. Her creativity and innovation with App Check is a testament to the work we do as school counselors to continually support our students. Do you have an innovative and creative program you have implemented at your school? We would love to hear about it!